“The Greatest Film of All Time.” It certainly seems like an arbitrary title, but if nothing else it gives film aficionados something to discuss. And that’s what Alfred Hitchcock’s Vertigo is now being called for many reasons. Rather than join the debate, I wish to take a few moments to acknowledge what makes the film itself special. 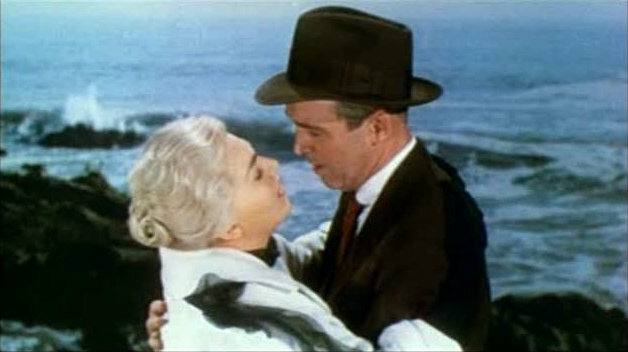 On the surface, shall we say the first viewing, Vertigo is thoroughly enjoyable as a psychological thriller and mystery. The title sequence is haunting with an eye staring back at us from behind the credits and as an audience we are quickly thrown into the action, watching the opening chase scene unfold. In only a few moments one man is dead and the other John “Scottie” Ferguson (James Stewart) now has debilitating vertigo that takes him off the police force. We never learn why they were chasing a man on the rooftops. It doesn’t really matter. It’s a time later with his friend Midge (Barbara Bel Geddes) that we first see Scottie after the harrowing events. She obviously cares deeply for him, and he sees her simply as a good friend so we can undoubtedly expect her to be in the film more. Then, rather mysteriously, an old school acquaintance named Elster (Tom Helmore) calls up Ferguson, hoping to get him to shadow his wife. It has nothing to do with infidelity, but fear, because the worried husband believes that something is wrong with his wife Madeleine. She disappears for hours at a time and is barely conscious half the time. He would describe her as possessed and Scottie is noticeably skeptical. But he relents and agrees to tail her sending himself spinning headlong into a mystery that will become his obsession. 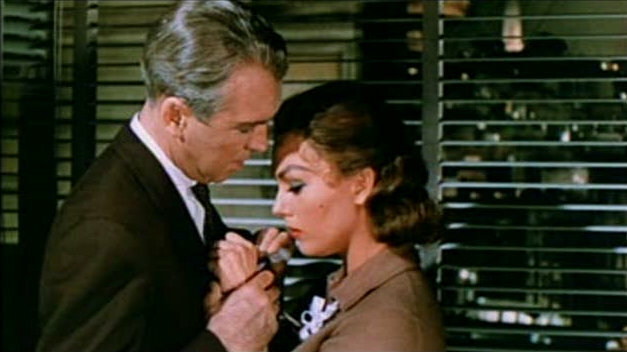 He gets to know Madeleine by following her, all throughout the streets of San Francisco, and much like Rear Window, this part of the film becomes a repetition of scenes followed by the reactions of Stewart. Hitchcock’s background in silents is seemingly at work here as he lets the images and score of Bernard Hermann take center stage along with Stewart’s expressions. We end up all over, from a flower stand to a cemetery, an art museum, and an old hotel. Madeleine goes from place to place like a solemn specter and we watch in expectation. Something must happen. In an instant, she leaps into the water near the Golden Gate to commit suicide and that’s when Scottie swoops in to rescue her. He can’t lose her now because by this point he’s entranced by the icy blond who he only knows from a distance. And so their relationship progresses if you can call it that. They wander together and Madeleine shares her nightmares with Scottie. The two of them head to San Juan Bautista and that’s when the nightmares become a reality for both of them. It’s devastating to Scottie, and the second phase of the film begins. He’s inconsolable and madly in love with this girl he cannot have. She’s hardly real. But then wandering the streets listlessly he spies Judy Barton, who coincidentally looks strikingly like Madeleine. So he does the only thing that he can think of, meet her and try to turn into the girl he so desires. His obsessions are the only things that drive him, that and the haunting memories. Finally, he figures out the mystery, but the swirling cycle continues as he goes back to San Juan Bautista. A cruel twist of deja vu rears it’s ugly head once more. Hitchcock always was one for visual showmanship and it reveals itself whether it’s the parallel symbolism that Scottie notes in the painting of Carlotta Valdes or the out-of-body dream sequence that he suffers through. There’s also the dizzying zoom creating the so-called Vertigo Effect whenever Stewart looks down from a great height. These are obvious visual flourishes, but it’s almost more interesting to watch our main characters walk the streets of San Francisco, especially since there are so many real landmarks to work with (ie. Golden Gate, Mission San Juan Bautista, Muir Woods National Monument, and the Coit Tower among others). There’s something mesmerizing and trance-like about all these scenes that’s difficult to discount. It pulls us in as an audience. We want to see more. Bernard Hermann’s score is, of course, noteworthy and at its core, there is a constant disconcerting quality. It is strangely majestic and beautiful, but it pounds away menacingly. And it spirals in and out with the same sounds, the same crescendos. You think you would get sick of it, but strangely enough, you don’t. It enraptures us. Then there are the players. 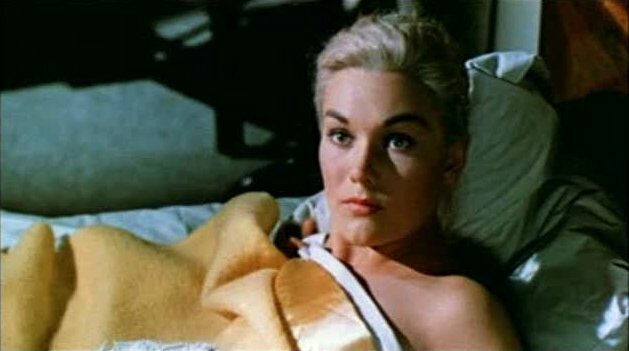 Kim Novak has the dual role as Madeleine and Judy. She carries out both with the needed precision. Elster’s wife is elegantly beautiful, aloof and ethereal in a way that makes her the obvious fantasy of Stewart’s character. When she casts a sidelong glance or stares up at Stewart there is a faraway quality in her eyes. The clothes. The hair. How she talks. Even how she carries herself. She is spellbinding, otherworldly, and almost unattainable in all ways. Then there’s Judy, the epitome of a Midwestern girl. Pretty but not elegant. Smart but not cultured. But she falls for Ferguson as he falls for an impossible ideal. 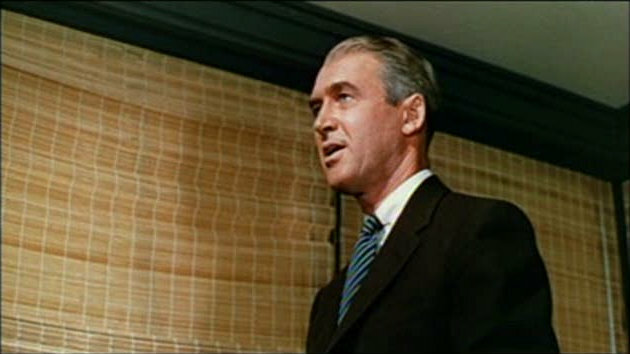 James Stewart is an important piece in this film because it’s his character’s obsession that drives the plot. His instabilities, his desires, his anguish, his vertigo. It has been said that Stewart himself is a stand-in for Hitchcock and the own inner workings of the director’s being. His obsession and lusts. That may be true but something else that could be inferred is that Stewart is really a stand-in for all of us. After all, there was no greater every man than him, but there also is a universal quality to the baggage weighing on his being. Stewart’s every man is certainly being subverted, or could it be he is becoming a more accurate depiction of everyone? It’s a scary thought but what is buried inside of us? What are our own fantasies, obsessions, and lusts that lurk under the surface? Let me put it a different way. For Stewart, he has three prominent women in his life. There’s the fantasy in Madeleine, the perfect ideal, who will ultimately ruin his life because intimacy with her is impossible. There’s Judy who has a passionate love for him, but it seems complicated in so many ways. She’s trying to measure up to his standards. The ideals and fantasies he has created poison what they could have. Then, there’s Midge who is practical, funny, and also completely devoted to Scottie. If his head were on straight he would go right to her because he would undoubtedly find the most satisfaction in that relationship, but his obsessions have undermined that. There was an alternate ending of the film which showed Scottie with Midge once more, listening on the radio about Elster’s capture. The ending that was kept is more powerful, not because Elster got away scotch free, but because we don’t see Midge again. She all but disappears by the end of the film and with her goes all that could have been decent and good about reality for Scottie. He gets so caught up in fantasy and that tears his life apart. He’s literally spiraling in a web of never-ending hellish obsession. Who knows what becomes of him? We can only guess. 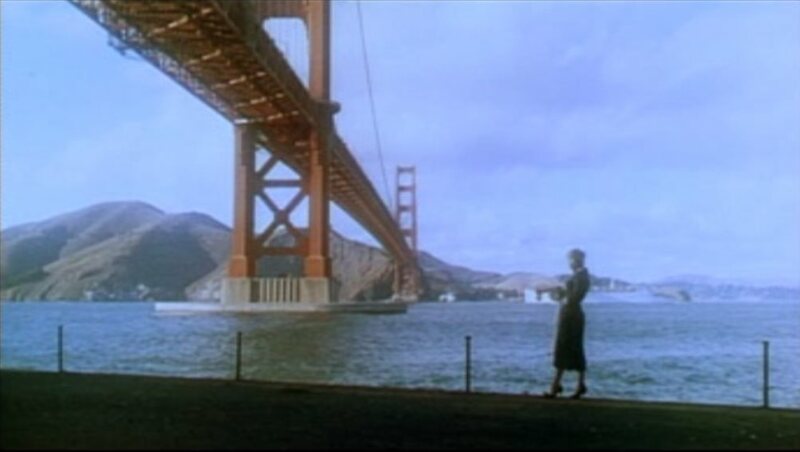 This entry was posted in 1950s, Mystery, Romance, Thriller and tagged AFI, Alfred Hitchcock, Barbara Bel Geddes, Bernard Hermann, Great Film, James Stewart, Kim Novak, Psychological, Review, San Francisco by 4StarFilmFan. Bookmark the permalink.